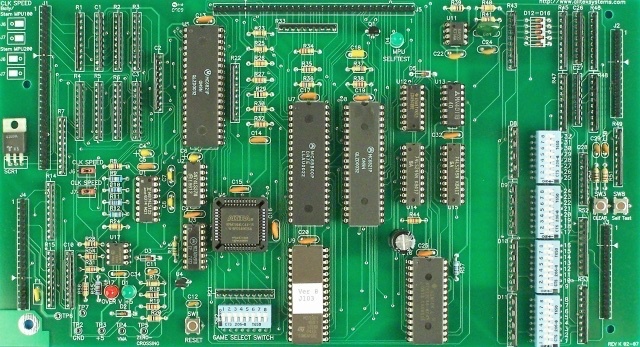 Replacement MPU for BALLY and STERN pinball games! 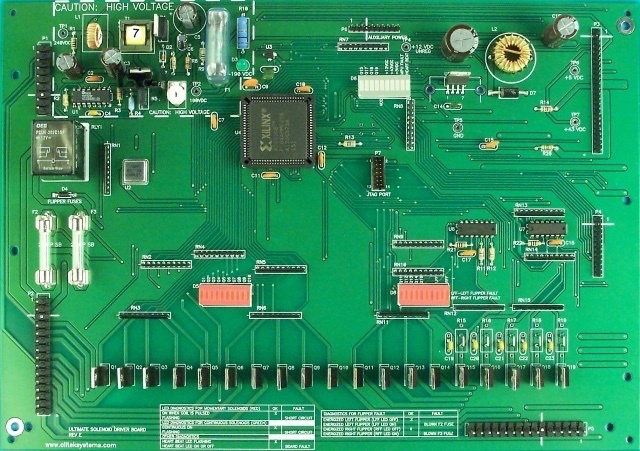 Now introducing the ULTIMATE DRIVER BOARD for Stern and Bally pinball games! The Ultimate MPU (no longer needs batteries!) is only $199.95US plus shipping (and tax(es) in Canada). Modern switching power supplies, high efficiency, Less Heat, No more big heat sinks. Keeps the backbox cooler. Upgrade your game with modern technology! Full adjustable 190Vdc @ 50 watts like the original design for games with extra displays. Short circuit protection on the high and low voltage power supplies. Forget about blowing and replacing every part in the old high voltage power supply because of one bad display. +5vdc @ 5amp low voltage power supply. Extra power for popular LED style displays. LED status indictors on all voltages. Using the latest MOSFET devices for solenoid drivers. Lower on resistance MOSFET drivers means more responsive coils – better, faster pinball action. All Solenoid MOSFET drivers have dual function LED indictors that indicate proper operation as well as indicating a fault condition such as a shorted coil. Makes game repairs fast and easy. Fused flippers for added flipper circuit protection. No more blown board traces from a miss wired coil. MPU fault protection circuit. Protects solenoid drivers and coils from shorts. Caused by a faulted MPU which locks on a solenoid. Designed by Engineers who are pinball experts. 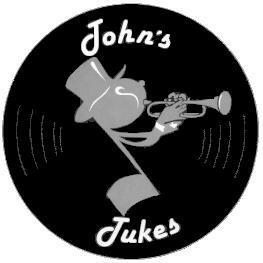 All information on this site is Copyright (©) 1997 through 2019 by John's Jukes Ltd.